While Australia might be on the other side of the world, it continues to be a popular destination for American tourists thanks to its beautiful beaches, amazing wine, and the Great Barrier Reef. Now you just have to figure out the best way to get there! Unlike when traveling to Europe (where you can connect in one country and take a short flight to another with ease), Australia doesn’t really present that option. If you’re connecting abroad, you’ll likely have to do it in Asia — which means your connecting flight could be over 10 hours. 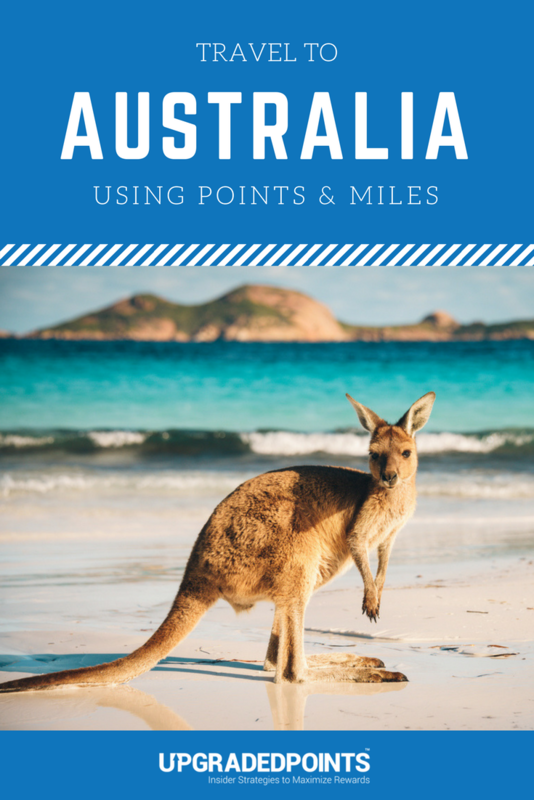 While that might work for some folks, we’re going to check out some of the best ways to fly to Australia with miles and points that don’t require you to take long connecting flights. You might have to catch a short flight within the U.S., but that will be much more convenient. Whether you are looking for economy, business, or first class flights to Australia, we have you covered — so let’s dig into it. While there aren’t many airlines that fly between the U.S. and Australia, you do have a number of great options to book award flights with your miles and points. Alaska Airlines might not offer flights to Australia, but the Alaska Mileage Plan program offers a great way to fly to Australia thanks to one of its partners. If you’re looking to use the fewest miles possible to fly business class or first class, this is the program for you. When compared to the other U.S.-based airline loyalty programs, Alaska Mileage Plan really stands out. While many programs use region-based programs, Alaska Mileage Plan provides a slight twist. Rather than having a standard region to region chart, Alaska Mileage Plan has specific award prices for individual airlines. This means that an award booking to Australia can cost more or less based on the partner you fly. Fortunately, flying non-stop from the U.S. (or with a connection in the U.S.) will require the fewest number of miles. Not only will you save some miles, but you’ll also get to Australia much quicker than if you connected in Asia. The key to this is finding award space on Alaska Airlines’ partner Qantas. While business and first class award space are often sparse, it’s definitely worth booking if you can snag it. Booking is as easy as running a search on the Alaska Airlines website. Let’s check out how many miles you will need to book a round-trip award, as well as the taxes and fees you can expect to pay when booking a flight on Qantas with Alaska Mileage Plan miles. These fees include a partner booking fee of $12.50 for each direction of the trip, so $25 for a round-trip award booking. Clearly, you’re better off booking an award flight on Qantas. Fortunately, you won’t be hit with any fuel surcharges on either of these bookings. Need help with booking? Check out our step-by-step guide to booking Qantas business class or first class to make the booking process easy. Alaska Airlines Mileage Plan has competitive redemption rates for economy class, business class, and first class awards. You can use Alaska Mileage Plan miles to book nonstop flights from 4 airports in the United States. If you need to connect to one of these gateway airports from which Qantas operates, you’ll need to do it on Alaska Airlines — this is the one difficult part of using Alaska Mileage Plan miles. One interesting option is to fly Qantas from New York City (JFK) to Los Angeles (LAX) so you can catch your Qantas flight to Australia. To book the Qantas flight from New York City, you have to book a flight to Australia; you cannot just book a flight on Qantas to Los Angeles. Qantas also gives you the most access to Australia with flights to 3 major cities: Brisbane, Melbourne, and Sydney. To fly American Airlines to Australia, your only option is to travel from Los Angeles to Sydney. Of course, you can connect on Alaska Airlines or American Airlines from many cities in the U.S., which makes it a bit easier. Alaska Mileage Plan miles aren’t the easiest to earn, but you do have a few solid options. Bank of America provides the cobranded Alaska Airlines credit card, which allows you to earn Alaska Mileage Plan miles directly. Bank of America provides both a business and a personal version of the card. Currently, United Airlines operates a Boeing 787 with a 2-2-2 business class cabin layout. First class is not offered by United on this route. Image courtesy of United Airlines. With ANA Mileage Club, you will find the best redemption rates for economy class and business class to Australia on United Airlines. In fact, if you’re flush with American Express Membership Rewards points, this will be your best option. To find award space on United flights to Sydney (SYD) and book with ANA Mileage Club miles, you simply need to run a search for partner awards on ANA’s website. While United Airlines doesn’t have a great reputation in comparison to ANA, it is the only Star Alliance option with nonstop flights to Australia. With ANA Mileage Club, determining how many miles you need will be easy as ANA uses a region-based award chart. The biggest factor to keep in mind with ANA Mileage Club is that you cannot book one-way awards; you must book a round-trip itinerary. Check out the round-trip redemption rates and an estimate of the taxes and fees you can expect when using ANA Mileage Club to book United flights to Sydney. ANA Mileage Club’s business class redemption rate is the real sweet spot — it’s 40,000 miles less than what’s required by United MileagePlus! Economy awards are also cheaper (but not by much), while first class awards are just a touch higher than what you’ll find with United MileagePlus. When you search for award space, make sure you find flights on United, as other options on Star Alliance carriers will also show in the search results. Need help booking? Check out our step-by-step guide to booking business class award tickets on United Airlines. While ANA Mileage Club requires you to book round-trip award tickets, it provides a great way to book flights to Sydney on Australia. Unlike Oneworld — which has Qantas and American Airlines flying nonstop routes between the U.S. and Australia — Star Alliance only has United Airlines. You can book nonstop flights on United from San Francisco (SFO) and Houston International (IAH) to Sydney (SYD), but that’s it. All other Star Alliance bookings will require a stop in Asia, which can add a significant amount of time depending on flight schedules and award space. Earning ANA Mileage Club miles is a little bit easier than the first program we discussed, Alaska Airlines Mileage Plan. ANA partners with American Express Membership Rewards. Points transfer at a 1:1 ratio. With Amex Membership Rewards, you will have plenty of card choices that have bonus categories and solid welcome bonuses to help you earn the necessary points to fly to Sydney. 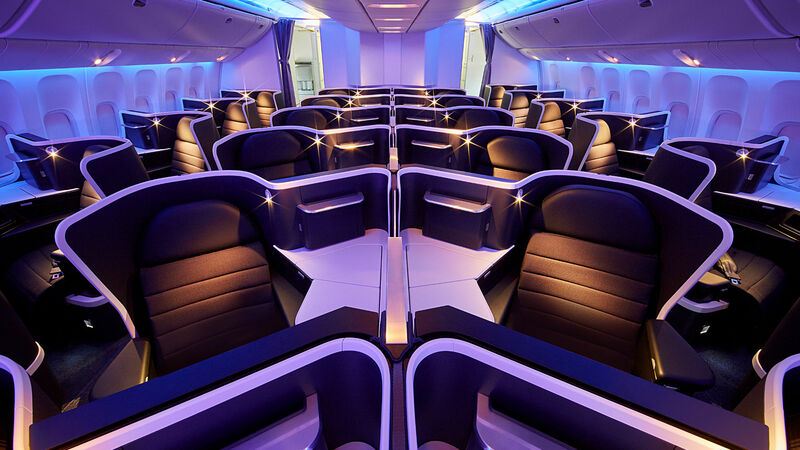 A lie-flat seat with direct aisle access to keep you comfortable in business class on American Airlines’ Boeing 787-9 on your flight to Sydney, Australia. Image courtesy of American Airlines. For many travelers in the U.S., American Airlines AAdvantage is their go-to frequent flyer rewards program. When booking flights to Australia, AAdvantage provides a great option since American Airlines and their partner Qantas both offer nonstop flights to Australia. The American AAdvantage program uses a region-based award chart, so flights from anywhere in the United States to Australia will require the same number of miles. To search for award space on either American Airlines or Qantas, simply visit American’s site and choose “Redeem Miles” when you search. Hot Tip: One big advantage of the American AAdvantage program is that you can put award seats on hold for up to 5 days. While the redemption rates aren’t the cheapest out there, it’s easy to book with American AAdvantage and get connecting flights to a gateway airport with flights to Australia. Let’s take a look at the round-trip redemption rates plus the taxes and fees you can expect when booking with American AAdvantage miles. If you want to fly first class, your only option will be Qantas — American Airlines does not operate a flight to Australia with a first class cabin. Need help booking? 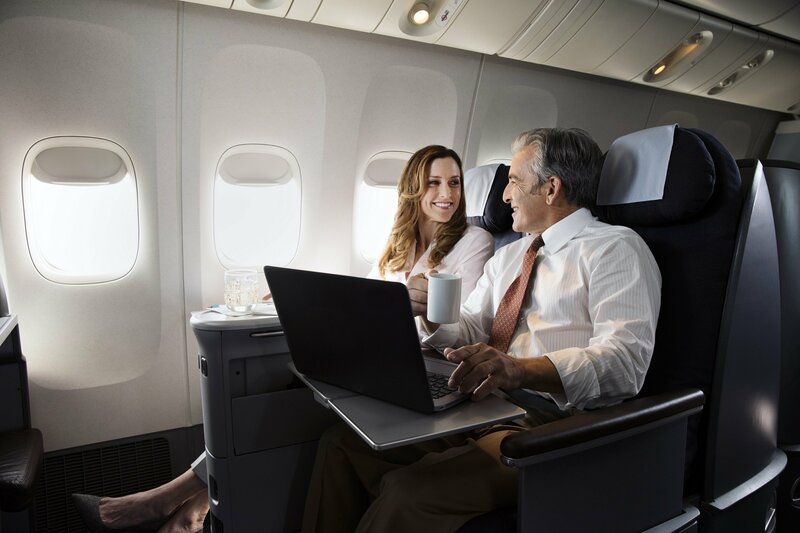 Check out our step-by-step guide to learn the best ways to book business class award tickets on American Airlines. 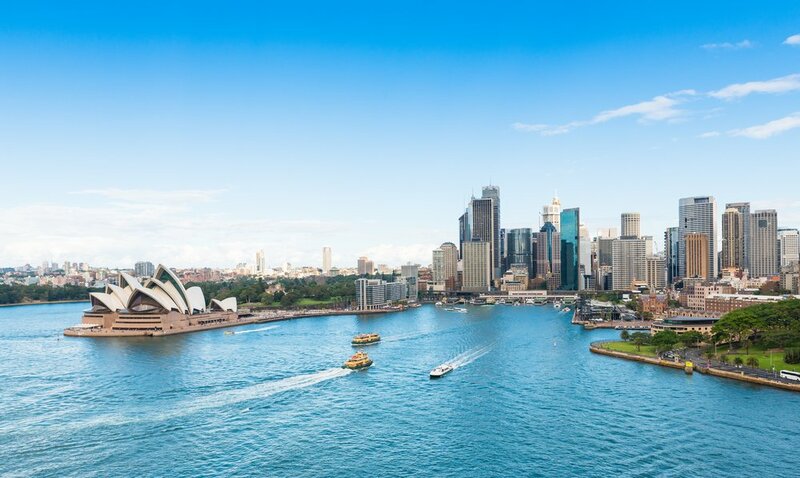 With several ways to earn American AAdvantage miles, you’ll have no problem booking an award flight to Australia on either American Airlines or Qantas. Oneworld provides the most routes from the United States to Australia by far, mostly thanks to Qantas. Here are the 6 routes you can book with American AAdvantage miles. Remember, you can connect from your home airport for no extra miles. American AAdvantage miles aren’t the easiest to earn, but you do have several credit card options that can help you earn more for your big trip to Australia. American Airlines has co-branded credit cards provided by Barclays and Citi, which can help you earn American AAdvantage miles directly. Both card issuers often provide solid sign-up bonuses on these co-branded cards, assuming you can hit the minimum spending requirement within the stated timeframe. Delta operates a Boeing 777 on flights between Los Angeles (LAX) and Sydney (SYD) with a herringbone business class layout. Image courtesy of quirrow.com. Often derided for not having a public award chart and increasing redemption rates without notice, Delta SkyMiles could still be useful if you have American Express Membership Rewards points. 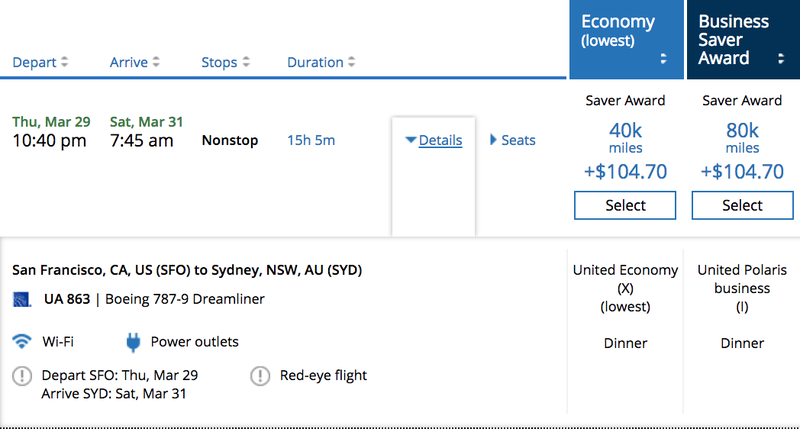 Delta SkyMiles also gives you 2 airline options when flying to Australia. 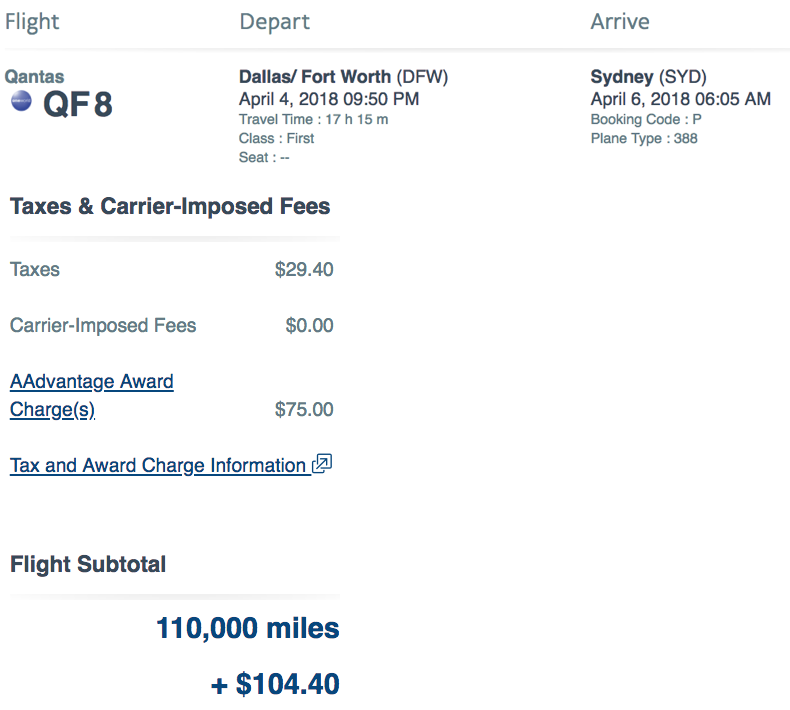 While Delta SkyMiles can be tough to use for booking award flights to Australia because of incredibly high redemption rates, your miles can be useful if you find saver level award space. The hard part is knowing how many miles saver level will require without a public award chart. Here’s what you need to look for when booking an award flight to Australia on either Delta or their partner Virgin Australia. We’ve also included an estimate of the taxes and fees. You’ll notice that Delta requires significantly more miles to book award flights with its partner Virgin Australia. 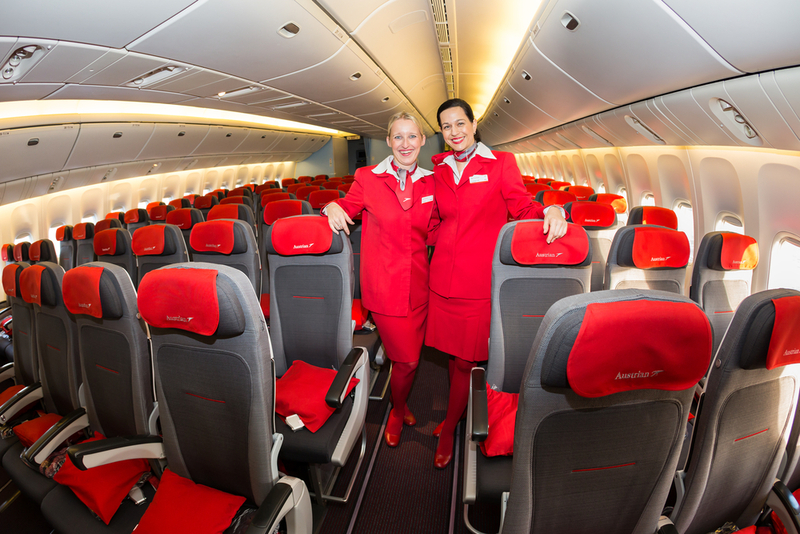 Specifically, a round-trip economy class award ticket will cost 20,000 SkyMiles more, while a business class award ticket will require an additional 42,000 miles when booking Virgin Australia. However, the required taxes and fees will remain the same. 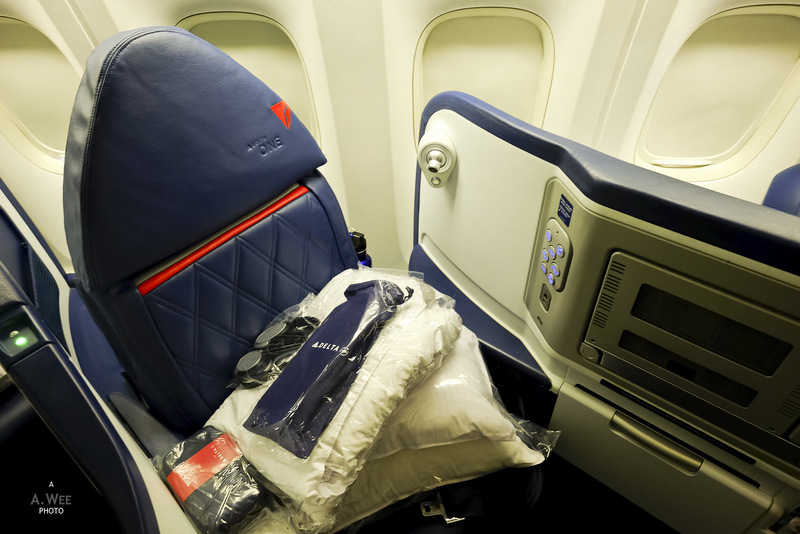 For those booking business class, Delta operates a Boeing 777 with a herringbone cabin layout. While the layout is 1-2-1 (which means direct aisle access for everyone), you will be facing the person across from you. This does not provide much privacy. If you fly Virgin Australia business class, the business class cabin is also arranged as 1-2-1 — but its reverse herringbone layout provides much more privacy. Don’t be surprised if Delta requires more miles if you need a connecting flight within the United States. Additionally, Virgin Australia award space is quite tough to find (especially business class), but sometimes you will find more space closer to departure. Delta doesn’t have the best redemption rates, but SkyMiles are one of the few ways to book award flights to Australia on Virgin Australia. Delta only operates 1 flight to Australia, while Virgin Australia provides 3 options — one to each major city on the east coast of Australia. All of these flights operate from Los Angeles (LAX). The best transfer partner if you need more Delta SkyMiles is the American Express Membership Rewards program, which transfers points at a 1:1 ratio. On top of that, there are several Membership Rewards cards to choose from that can help you earn plenty of points. You can also use one of Delta’s co-branded credit cards provide by American Express to earn more SkyMiles directly. These cards also provide a free checked bag on flights operated by Delta. United’s own MileagePlus program is going to be your best option for flying United to Australia if you have Chase Ultimate Rewards. We’ll also take a look at an easy way to gain access to more economy class saver level award space with United. It’s quite easy to use your United MileagePlus miles to book award flights. You simply run a search online and select your flight once you find award space. At times, United gives its own MileagePlus members access to more saver level award space than its partners. Even though the award rates might not be as competitive as those of ANA Mileage Club, this can be very useful. 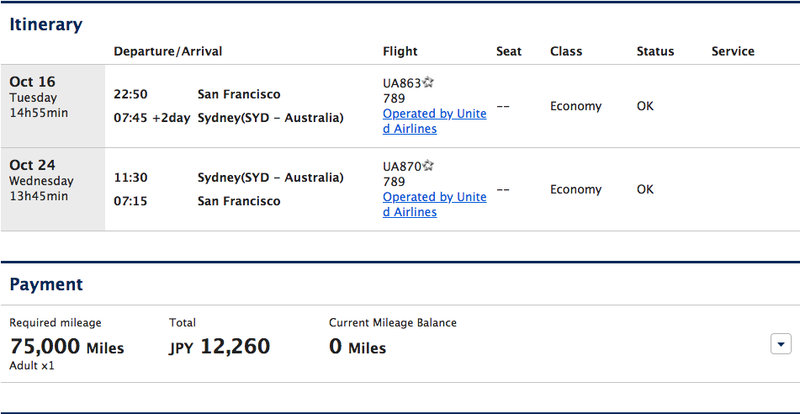 United Mileage Plus miles can help you book award flights on United Airlines to Sydney from either Houston International (IAH) or San Francisco (SFO). As the only Star Alliance carrier operating nonstop flights between the U.S. and Australia, you will have limited opportunities to use your United MileagePlus miles. United operates 2 flights to Sydney (SYD): 1 from Houston International (IAH) and 1 from San Francisco (SFO). Currently, neither of these routes have United’s new Polaris business class cabin layout. You’ll notice the search results will show “United Polaris business,” but that only means you are flying an aircraft with an international business class layout. Routes with the newer Polaris seats and cabin layout are few and far between; we’ll keep an eye out for any change to United’s flights to Sydney. One of the biggest benefits of United MileagePlus is that it partners with the Chase Ultimate Rewards program. By transferring Ultimate Rewards points at a 1:1 ratio, you can quickly boost your United MileagePlus balance. You can also earn United MileagePlus miles directly through any of the co-branded United cards provided by Chase. If you have any of these cards, you will have access to additional saver level economy award space. When you consider that award flights to Australia can be tough to find, this could make accessing award space easier for you. You can fly Qantas first class from Los Angeles (LAX) or Dallas (DFW), and enjoy plenty of space and a nice meal or 2 on the long flight to Australia. Image courtesy of Qantas. American AAdvantage and Alaska Mileage Plan give you a couple simple options to book both American Airlines and Qantas flights to Australia from anywhere in the U.S. However, Cathay Pacific Asia Miles and Japan Airlines Mileage Bank both have distance-based award charts that can provide some interesting options. Except for Melbourne, the redemption rates for economy, business, and first class awards from the U.S. to major cities in eastern Australia will require the same number of Japan Airlines Mileage Bank miles. You can earn Marriott points and transfer those to Japan Airlines at a transfer rate of 3:1. Plus, for every 60,000 Marriott points that you transfer, you’ll receive an extra 5,000 Japan Airlines miles bonus. Asia Miles made major changes to their awards on June 22, 2018, with awards now called Standard Award and Choice Award. Flying Cathay Pacific, US to Australia awards now price under the Ultra-Long Haul price. Flying Asia Miles partners gets complex fast. If you fly multiple Oneworld partners there is a unified distance-based chart. If you fly an individual partner airline, Asia Miles has separate award charts for every partner. Consult them here. In addition to using Delta SkyMiles for Delta flights to Australia, you can also use Air France/KLM Flying Blue and Korean Air SkyPass. Note: Flying Blue will announce new award prices for many routes in June 2018, stay tuned for updates. If you’re planning to book an economy class flight on Delta, you can use 100,000 Air France/KLM Flying Blue miles. Unfortunately, Flying Blue miles are not a good choice for business class redemptions. You can expect similar taxes and fees of around $155 per person. You can search for award space on Delta flights using Air France or KLM’s websites and book from there. Korean Air SkyPass miles will not be a go-to for economy class awards, but they are a solid way to book business class awards on Delta flights. 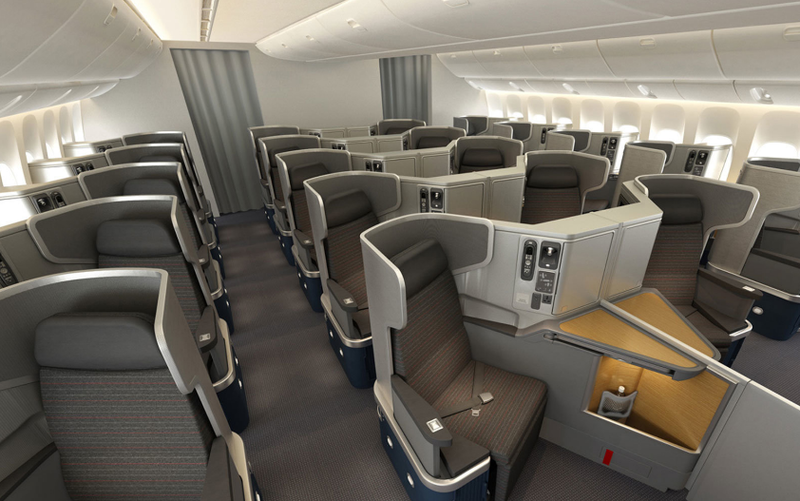 Business class awards will cost 185,000 Korean SkyPass miles. As with Flying Blue, you can expect roughly $155 in taxes and fees. 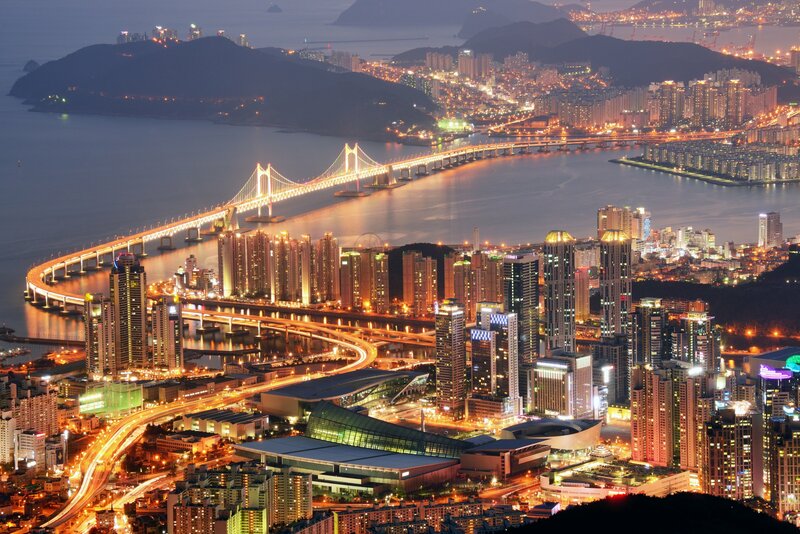 An important aspect of the Korean Air SkyPass program to remember is that you are required to book a round-trip award. In theory, you could fly one-way — but you’d still be required to use the mileage cost for a round-trip ticket. You can search for award space on Korean Air’s website; make sure you select SkyTeam Award. You can either book from the site or call Korean Air. You can transfer Chase Ultimate Rewards points to your Korean Air SkyPass account when you are ready to book. You can use Virgin Atlantic Flying Club miles to book a business class award on Virgin Australia from Los Angeles (LAX) to Sydney (SYD), Melbourne (MEL), or Brisbane (BNE). Image courtesy of Virgin Australia. Another option to book Virgin Australia flights between Los Angeles (LAX) and Australia you might want to consider is the Virgin Atlantic Flying Club. You can book a round-trip economy class award for 94,000 Flying Club miles. If business class is more your style, you can use 188,000 Flying Club miles for a round-trip award. Hot Tip: You can use Delta’s website to search, then call Virgin Atlantic Flying Club to put your award on hold. Once you have done that, you can transfer points from any of the transferable points programs and then call back to complete your award booking. Unsurprisingly, nonstop award flights to Australia from the United States can be quite difficult to find, particularly during peak travel seasons such as Christmas and New Year’s. If you have a hefty balance of any of the transferable points we’ve discussed, you’ll at least have a couple options to book an award flight to Australia. Remember that when using distance-based programs such as Japan Airlines Mileage Bank or Cathay Pacific Asia Miles, you’ll want to consider your departure airport. If you’re on the East Coast, you might need more miles for your booking. 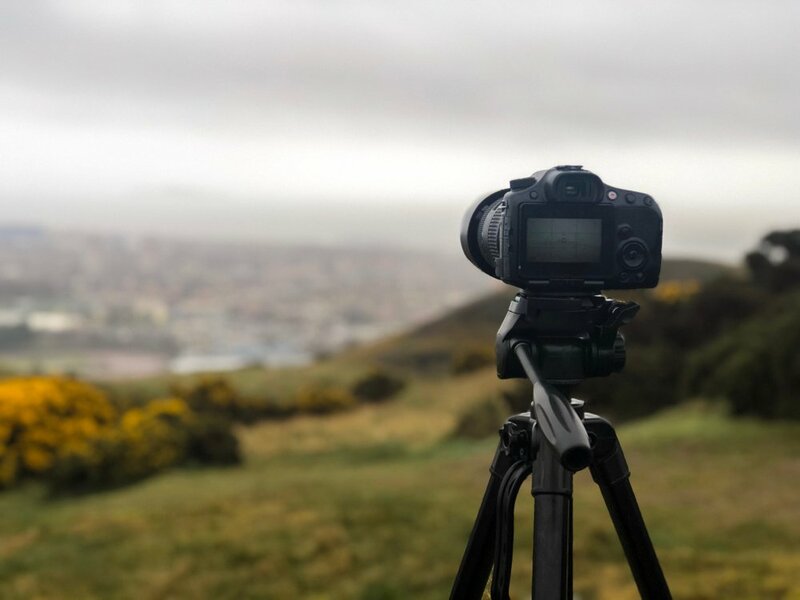 Fortunately, the taxes and fees required for these bookings are reasonable — all you have to do is decide when you want to go and start searching for award space! What is the fewest number of miles you can use to book an economy class award flight to Australia? Japan Airlines Mileage Bank requires the fewest miles for a round-trip nonstop economy class award on American Airlines or Qantas to Sydney or Brisbane at 60,000 miles. If you’re flying from the East Coast to Melbourne, American AAdvantage and United MileagePlus require 80,000 miles round-trip. What is the fewest number of miles you can use to book a business class award flight to Australia? As with economy awards, Japan Airlines Mileage Bank provides the cheapest business class award option at 100,000 miles to Sydney and Brisbane. Flying from the East Coast, you can book a business class award for 110,000 Alaska Mileage Plan miles if you can find an itinerary that includes only 1 partner (American Airlines or Qantas). 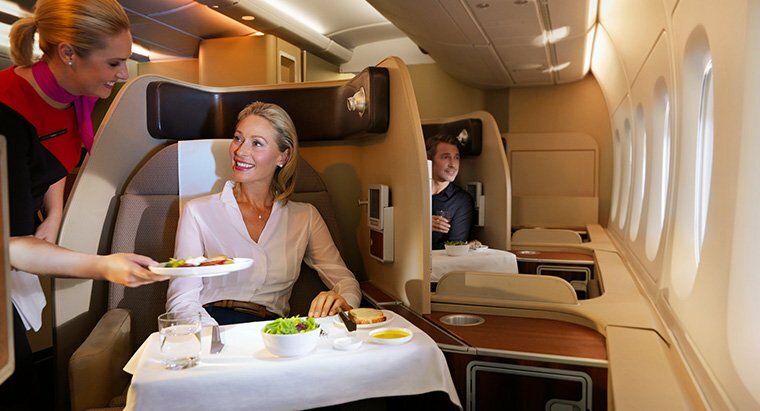 What is the fewest number of miles you can use to book a first class award flight to Australia? Your first class options are limited to flights on Qantas. You can fly Qantas first class round-trip for 140,000 Alaska Mileage Plan miles. Have seen your posts on OMAAT. This is an absolutely awesome post! Will help me tremendously.